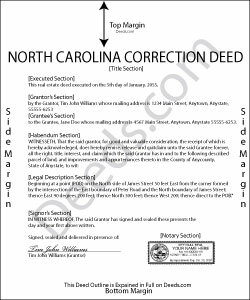 Use the correction deed to correct errors in a warranty, special warranty, or quit claim deed in North Carolina. In North Carolina, several correction options may be used: an affidavit of correction, also called scrivener's affidavit; a re-recording of the original erroneous deed; and a newly drafted correction deed. Choosing the best option will depend on the type of error in the deed. Minor or typographical errors can be addressed through the affidavit (N.C.G.S. 47-36.1), but material errors and any errors affecting the legal description require a correction deed, or at least a re-recordation of the corrected original deed. The affidavit of correction goes on public record with cross-reference to the deed and constitutes notification of an error, but not an actual correction. When re-recording the original deed, make corrections directly on the document (or a certified copy of it). Initial these changes and have the document re-signed by the original parties and re-acknowledged. Check with the county's recording office before choosing this option to verify local requirements regarding title pages, contents and fees. The easiest and cleanest option for correcting a deed is to record a new correction deed. This eliminates the need to determine the type of error and its potential impact on the ability to sell the property at a later point. The correction deed references the original document by date and recording number and, except for the corrected or omitted information, duplicates the text of the old deed. The original parties must sign in the presence of a notary, who then acknowledges this new instrument prior to recording. Garry D. said: Prompt delivery of easy to use forms and clear instructions. Good value. Reply from Staff: Thank you Roy. We appreciate your feedback.